For the pharaoh of the 16th Dynasty, see Nikare II. 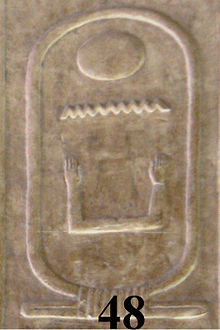 The cartouche of Nikare on the Abydos King List. Nikare (also Nikare I) was an ancient Egyptian pharaoh of the Eighth Dynasty during the early First Intermediate Period (2181–2055 BC), at a time where Egypt was possibly divided between several polities. According to the egyptologists Kim Ryholt, Jürgen von Beckerath and Darrell Baker he was the ninth king of the Eighth Dynasty. As such Nikare's seat of power would have been Memphis. Nikare is only known for certain thanks to the Abydos King List, a king list redacted during the reign of Seti I, where his name appears on the 48th entry. Nikare may also have been mentioned on the Turin canon but his name and duration of reign are lost to a large lacuna affecting kings 2 through 11 of the Eighth Dynasty. According to the egyptologist Peter Kaplony, a single faience cylinder-seal may possibly bear Nikare's name and could thus be the only contemporary attestation of this king. A gold plaque, now in the British Museum, is inscribed with his name along with that of Neferkamin, however it is now believed that this object is a modern forgery. ^ Peter Kaplony: Die Rollsiegel des Alten Reichs, vol. 2: Katalog der Rollsiegel, (= Monumenta Aegyptiaca. Vol. 3), La Fondation Égyptologique Reine Élisabeth, Brüssel 1981, issue 144. ^ Gold plaque EA 8444 in the British Museum. This page was last edited on 5 November 2018, at 21:13 (UTC).